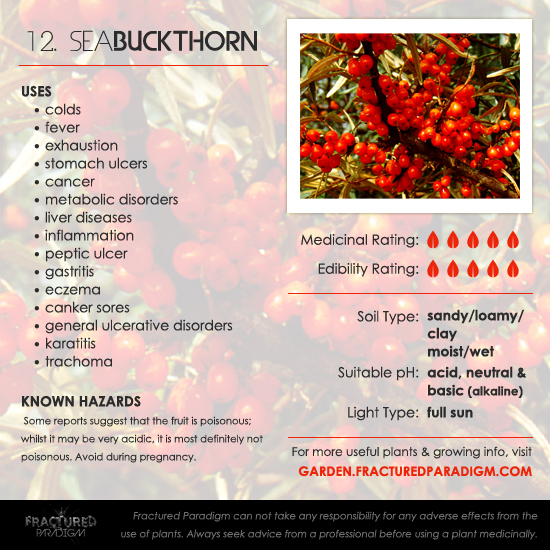 We love this graphical overview of sea buckthorn as a garden plant. Besides a high rating for edibility and medicinal use, it gives a brief rundown of sea buckthorn’s ideal growing conditions. The uses listed leave a little to be desired but are still excellent tips! For more health benefits provided by the wonderful sea buckthorn berry, click here! This entry was posted in Health Benefits, News. Bookmark the permalink.